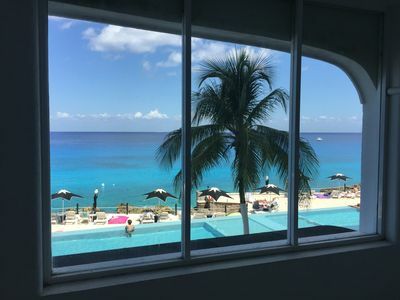 If you are looking at our property, you have already decided that you want to spend your vacation in a safe place that offers privacy, quality furnishings, beautiful views, and a sense of home, while still offering convenient access to beach, town and amazing restaurants. 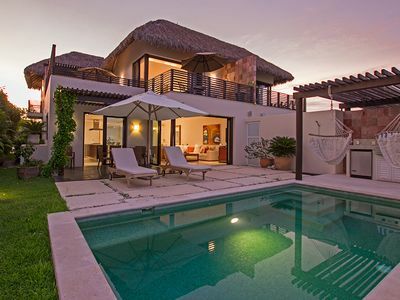 Casa Mar Pacifico is penthouse #2, located in Los Siete Mares, a boutique unit with secure access. Our condo was featured in the HGTV show, Househunters International which aired Sept 2016, Season 91, Episode 8 titled "Seeking Syle in Mexico". 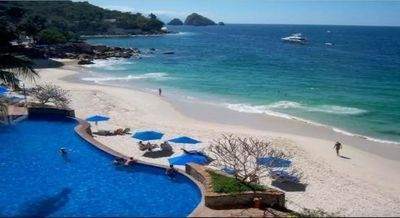 The condo is located just above the beautiful Conchas Chinas beach. 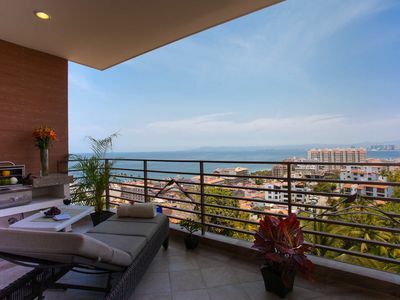 Conchas Chinas is considered the "Beverly Hills" of Puerto Vallarta, due to it's beautiful hillside homes, ocean views, and easy access (5 minutes by taxi) to Old Town (Zona Romantica). 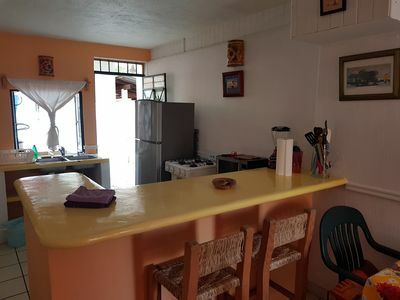 This condo is located in Lower Conchas Chinas, meaning you are on the ocean side of the road that divides the area with direct beach access. 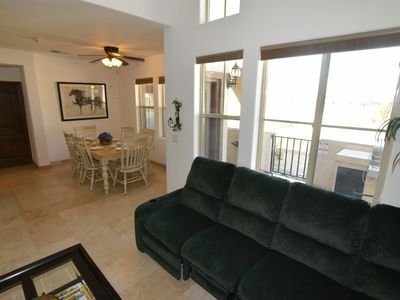 The 2,400 sq ft condo has completely remodeled kitchen and bathrooms. 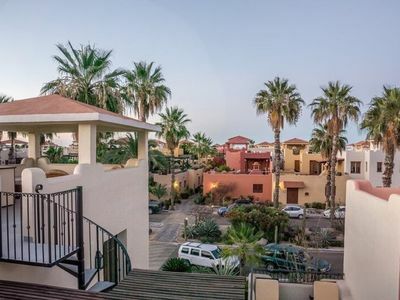 The complex and the unit itself is hacienda style with a modern twist, giving you the feeling of traditional Mexico but with all the modern conveniences. 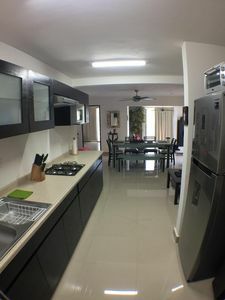 The high beamed ceilings and open concept make the unit feel very spacious and the tempered glass walls slide open to bring in the ocean sounds and view along with lots of light. Furniture, dishware and linens are all high quality so you feel as if you are in your own home and not a standard rental unit. There are unique stained glass windows throughout the unit that add to the charm and uniqueness of the property. Housekeeping is provided 2- 3x per week as part of the rental. There is also a shared laundry room on the property that you can use to wash any personal items. Eric, our property manager, is fluent in both English and Spanish and will ensure that you have an excellent stay. He will personally greet you at the airport, take you to pick up groceries and introduce you to the unit. The cost is $40 US or alternatively he can meet you at the condo if you arrange your own transportation. We also encourage you to take advantage of a one hour in-condo massage with Yenni, which Eric can arrange for you. She is excellent and charges $550 pesos for one hour (around $30 US). Nothing like a private massage on your own deck with the sounds of the waves and the feel of ocean breeze! Eric will also provide you his contact information so that he can help you with anything you need: whether it be restaurant recommendations, having a translation challenge, arrange a whale watching trip, fishing, diving/snorkeling or other site seeing excursion, or simply you get lost and can't remember the way home! The condo features custom furniture and lovely original artwork. 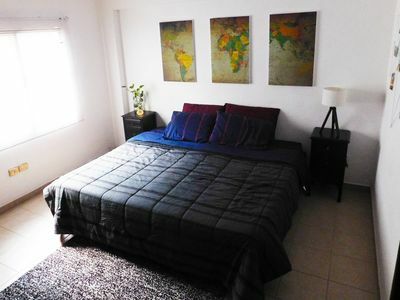 The Master bedroom has a custom made king sized bed with quality mattress and includes a private bathroom with double vanity and unique walk in open shower. Bedroom #2 includes two comfortable queen beds with private bath/shower combo and double sink vanity. 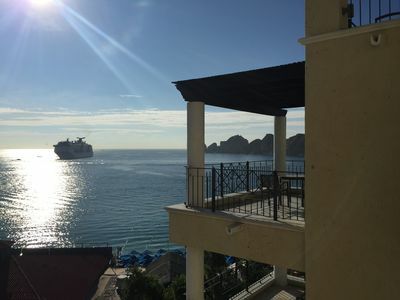 Both bedrooms have beautiful ocean views and their own deck access. For added privacy and comfort, the bedrooms are located on opposite sides on the condo, and include ceiling fans and air conditioning. The main room is expansive and is with equipped with a large screen TV with American stations, large dining table, designer sectional, and quality artwork from around the world. 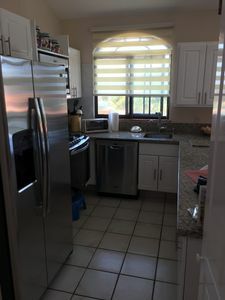 The gourmet kitchen is newly remodeled with high end stainless steel appliances, granite counter tops and island, extensive dishware and cookware. The tap water is save to drink, via filtered water accessible through the installed filtration system at the kitchen sink. Internet is available from all rooms. There are silent fans in every room, and all bedrooms and living rooms are equipped with air conditioning for your comfort (please use responsibly). 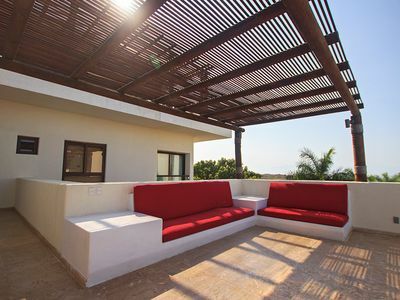 The deck is the star of the show, and includes dining furniture, high quality lounge chairs, plants, lighting, artwork, and of course, the view and sounds of the Mexican Riviera. 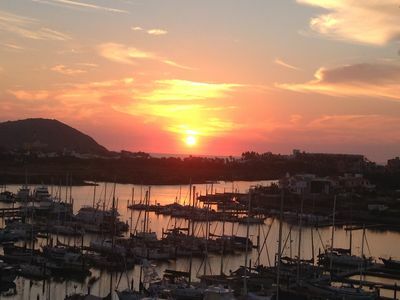 In season you can see manta rays, whales, and dolphins, plus spectacular sunsets. 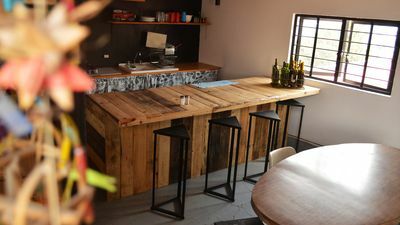 In case you don't feel like going into town or cooking, there are two excellent beachfront restaurants right next door to the condo, El Set and Lindo Mar Hotel restaurant (La Playita). The pool includes a swim up self serve bar, BBQ, and refrigerator where you can store your beverages while enjoying the pool and sun. There are plenty of lounge chairs, tables and umbrellas to share among the few residents and their guests. 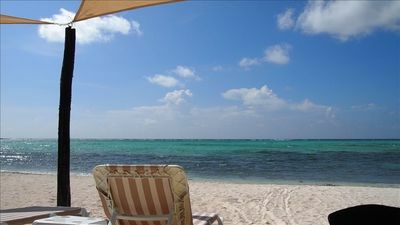 Beach chairs and umbrellas are available in the unit to bring down to the secluded beach below. Please note that because this property is in a small boutique complex so there are no elevators. Stairs are required to reach the penthouse or to gain access to the pool or beach. 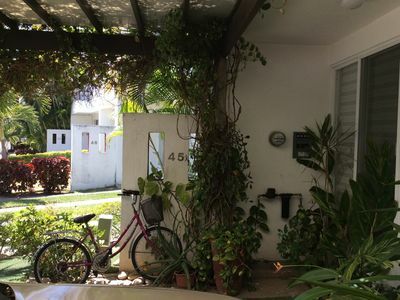 This property is an excellent choice for couples, friends, girl or guy weekends. It would not be ideal for disabled persons due to the fact there are no elevators. The quiet nature of the property is not condusive to loud gatherings or the spring break party crowd. Because this is also our private winter home and there is high end items, children are not allowed and the maximum number of guests is 4. Non approved guests will be asked to vacate the unit. The condo includes parking area for a rental car. Travel into town is easily accomplished by either hailing a taxi from the taxi stand just across the street, calling uber, going to the bus stop just outside, or taking the gorgeous 20 minute beach walk. Taxi ride from town is under 5 minutes and runs about $4.00 US dollars. If you are interested in employing a private chef for all or part of your stay, that can be arranged as well. We have traveled extensively and are very particular about where we stay and live. 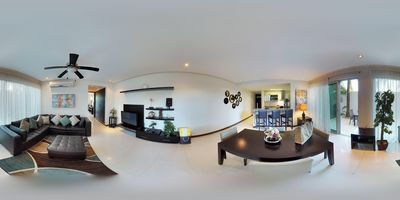 We feel this property's amenities reflects the high standards that we expect in a home or rental. 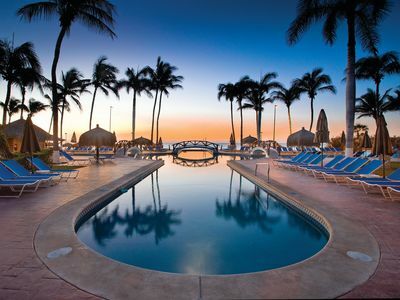 Our goal is for our guests to have a stellar experience and fall in love with Puerto Vallarta like we did! 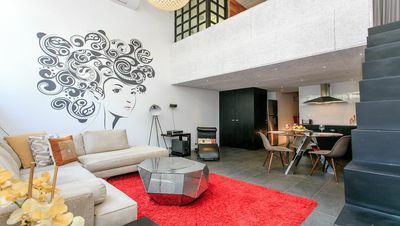 Cool & Comfy Loft- Check it out! A great place in a great location!! Luxurious 2 Bedroom Flat. Conveniently Located!